Trumpet players blew so hard to produce the slightest spit of sound that they almost passed out. Drummers snapped their sticks with all the rhythmic sense of a pair of tennis shoes in the dryer. The honks of confusion rang out in the music room on the first day of band practice. It was 1950 and Austin native Alvin Patterson, a 27-year-old recent graduate of the New England Conservatory of Music, sat in his office at Douglass High School in El Paso and wondered what he’d gotten himself into. The school had never had a band before. His thoughts turned to his mentor, B.L. Joyce, the larger-than-life band director at L.C. Anderson High School in East Austin. Patterson wondered how the man he called “Prof” would handle the situation. He took a deep breath, thrust the door of his office open and stood firmly before his musical beginners, but the dissonance barely dispersed. The Anderson High School Yellow Jacket Band, whose lofty alumni include bop trumpet great Kenny Dorham and former Motown arranger Gil Askey, had only two directors in its 38-year history. 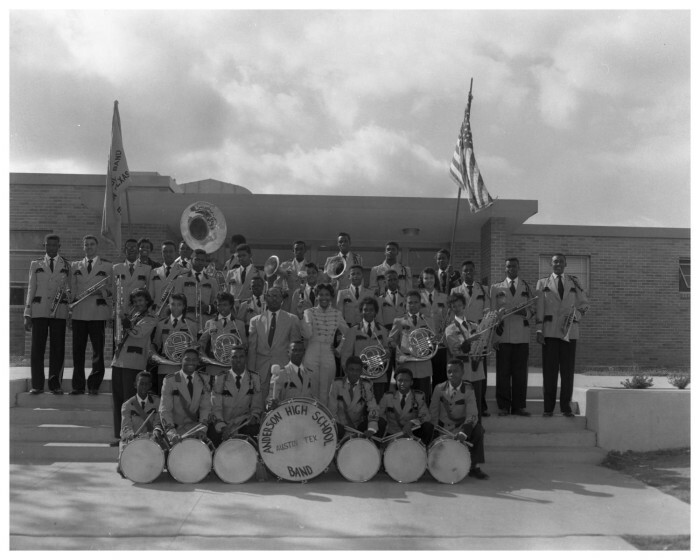 Joyce founded the band in 1933 and ruled it with an iron baton until Patterson took over in 1955, when the old man was forced to resign because of a new statewide regulation that required high school band directors to have music degrees. That Joyce, who got his college degree in tailoring from Tuskegee Institute in Alabama, didn’t step down voluntarily made for a rough return for Patterson. 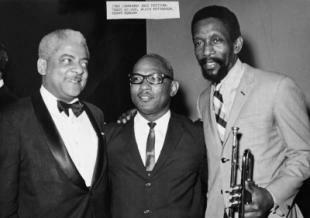 L-R Teddy Wilson, Alvin Patterson, Kenny Dorham at the 1966 Longhorn Jazz Fest. “We gave (Patterson) some grief that first year,” says Joseph Reid, who played clarinet in Joyce’s last and Patterson’s first bands. “If there was anybody you could call a legend in East Austin during that time, it was B.L. Joyce.” Imagine replacing Coach Paul “Bear” Bryant at Alabama or taking over “The Tonight Show” after Johnny Carson’s retirement. Several band members quit after Patterson’s first practices. But the 1940 Anderson grad didn’t shy from the challenge and was eventually able to carve his own imposing legacy until federal orders to desegregate closed Anderson, Austin’s historically black high school, in 1971. Long before Janis Joplin sang at Threadgill’s and Willie Nelson got the heads and ‘necks together at the Armadillo, Austin’s reputation as a music town was forged by the Anderson High School band. Resplendent in uniforms as bright as a September sunrise, the Yellow Jacket Band would trek to the annual Prairie View Interscholastic League competitions and invariably come back with a trophy. Under Joyce’s directorship, the Jacket band won the state championship seven times from 1940-1953. For most of the ’40s, ’50s and ’60s, the East Side was invisible to most of Austin’s West Siders. The predominantly black neighborhood on the other side of the freeway might as well have been a town far away. But when the Yellow Jacket Band marched down Congress Avenue, its presence was full and pronounced. The Yellow Jackets were the first black band to march at a Texas inauguration, for Gov. John Connally in 1959. They were the first all-black band to play in the Austin Aqua Festival parade a few years later. Besides Dorham, Miller and Askey, more than two dozen future band directors, including Ray Murphy (Hobbs, N.M.), T.W. Kincheon (Caldwell High), Richard Elder (Taylor High) and John Whitehurst (Boulder, Colo.), passed through the ranks, but then so did such notables as Travis County tax collector Nelda Wells Spears, Dr. James Hill (chief of the University of Texas community relations department), John Q. Taylor King (former Huston-Tillotson College president and head of King Tears Mortuary), longtime H-T music department head Beulah Curry Jones and educator Charles Akins, who became the first black principal of a predominantly white high school in Austin in 1973. A tailor who made custom suits out of his house at 1706 E. 14th St. and taught the trade at Samuel Huston College, Benjamin Leo Joyce was also a musician who played tuba in the Army band during World War I. With a desire to give black students the same kind of musical training given in the white schools, Joyce started canvassing East Austin in late 1932 looking for kids who wanted to play. He also solicited neglected instruments. An Austin trumpeter, William Timmons, had been teaching a community band over at the youth center on Angelina Street but he was soon off to join the Ringling Bros. circus band. 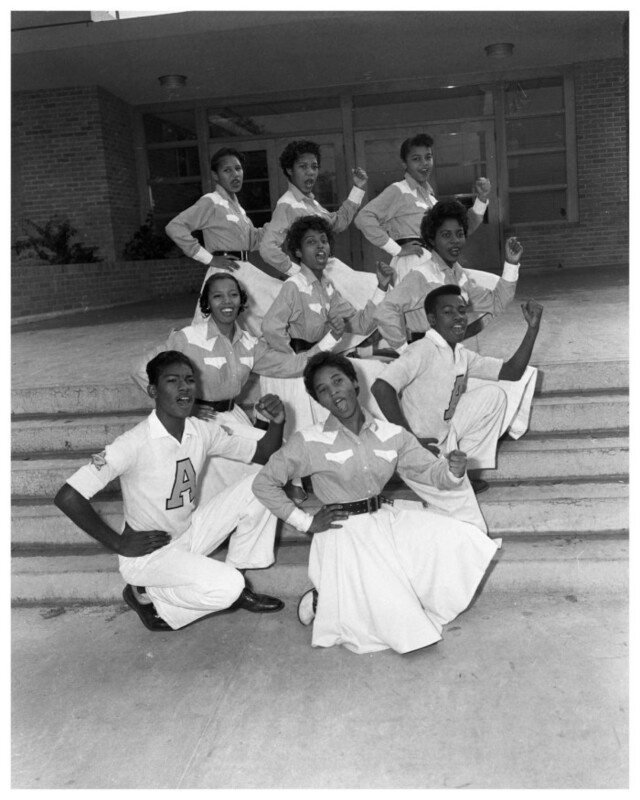 Joyce recruited four Timmons students — Alvin Patterson’s older brother Roy, Hermie Edwards, Ulysses Fowler and Raymond Edmondson — as the core of his first AHS band. Joyce made the uniforms that first year; no beginning band ever looked so snappy. Miller, who was also in the band at the time, recalls that the crowd went nuts when the precise, militaristic Yellow Jackets of marches and grand overtures turned to swing and jazz. “It lit a fire under the football team, too. We ended up winning the game,” she says, with a hearty laugh. Dorham, known for his dark trumpet tone and graceful melodic flights, died in 1972. But Patterson was able to hang with him one more time, when Dorham returned home, with fellow native Austinite Teddy Wilson and an all-star cast, including John Coltrane, Elvin Jones, Lightnin’ Hopkins and Dave Brubeck, to play the 1966 Longhorn Jazz Fest at the old Disch Field (next to City Coliseum). Whatever success Askey achieved, he was quick to credit Joyce. When the old man passed away in 1980, Askey, who currently lives in Australia, wrote a poem called “I Am an Extension of Him” for the funeral program. “Mr. Joyce lives on in the things I do, for without him there’d be no me,” it ends. The school was all black until the late ’50s when a handful of Hispanics attended. The first white student to graduate from Anderson was in 1970. The next year, following a U.S. Supreme Court decision that favored busing as a preferred method of integration, the federal government sued the Austin school district and ordered district schools to desegregate. As the first federal suit following the Supreme Court decision, the Austin case was a national news story for several months. AISD’s decision in July 1971 to comply by closing Anderson High, which had fewer than 20 nonblack students (out of a student body of about 800), “just devastated us all,” says Patterson. The one-way busing — with black students sent to white schools, but white students not sent to black schools — especially rankled East Austinites. On the first day of the new school year, 121 former Anderson High students did not report to their new schools. 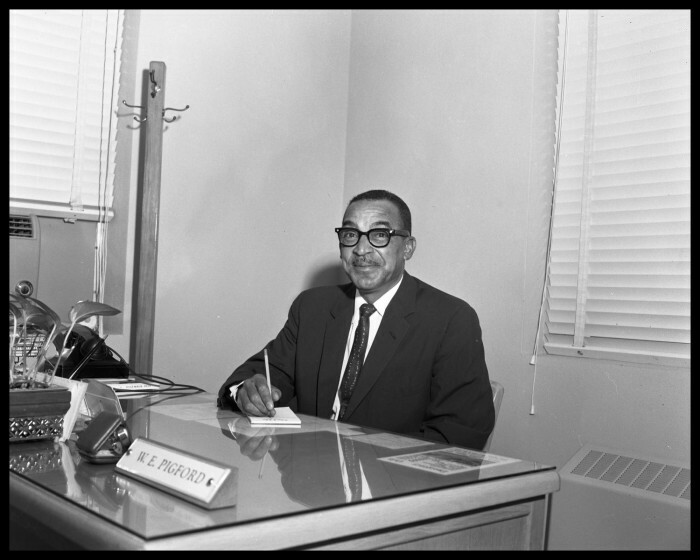 Patterson moved to McCallum High School, where many of the black students were bused, and remained a counselor in the community relations department until 1984, when he took a position as assistant to the dean at St. Edward’s University. He retired last June at age 80. Fittingly, a Juneteenth parade of marching bands ended at Patterson’s doorstep in East Austin, a show of appreciation for the 16 years he led the best high school marching band in Texas. The building at 1607 Pennsylvania Ave. that housed Anderson High School from 1913-1953 burned down 20 years ago. Kealing Junior High now sits on the site. The original Olive Street location of Anderson (1907-1913) — which was originally named E.H. Anderson High for L.C.’s older brother — burned down in 1947. But the brick building on Thompson Street, which housed L.C. Anderson High (renamed after the 1938 passing of its first principal) from 1953-1971, still stands. Anderson alum Thomas “Hollywood” Henderson has restored the running track and the football field on the west side of the school, but the building, which now holds the Boys & Girls Club and an alternative learning center, does not resemble a place that once anchored an entire community. Sometimes when Patterson drives on that street, his mind brakes for memories. Other times he drives by and looks away, not wanting to revisit what used to be. But it’s a special place, this building where Joyce passed him the baton, where he became a father figure to a family of students, just like the old man had been. The fumbling disorder of a band practice can, with the right guidance, evolve into the sweetest sound.